Seven years in the making, state officials on Monday unveiled the latest version of their ambitious plan for revitalizing the heart of California's embattled water system and securing supplies for decades to come. The Bay Delta Conservation Plan and its environmental review weigh in at 34,000 pages -- that's before public comments start pouring in next week for a 120-day feedback period. 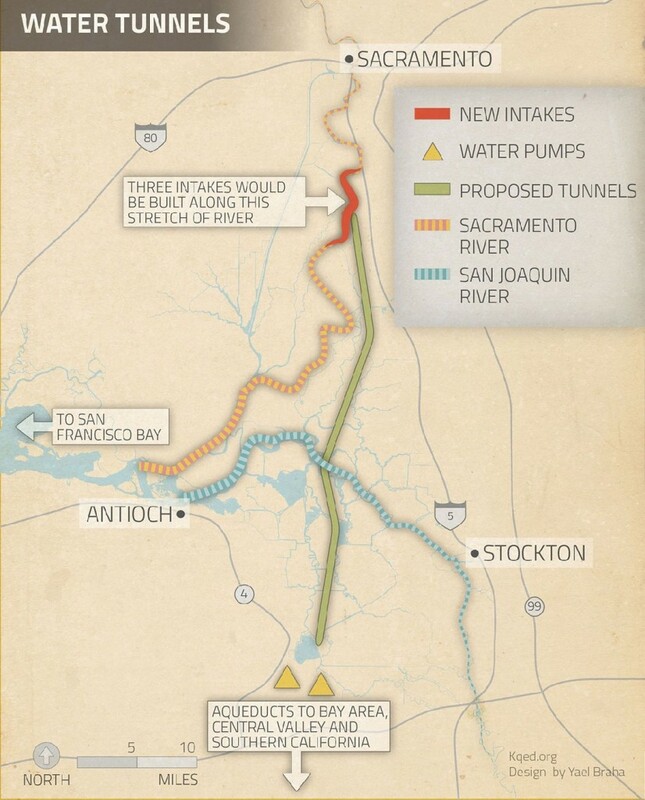 At the core of the plan is Governor Brown's proposal to build 35-mile twin tunnels underneath the sensitive Sacramento-San Joaquin River Delta, often referred to as the "switching yard" for California's elaborate freshwater plumbing system. Officials say the plan will achieve two “co-equal goals” – ensuring a reliable water supply for the state and restoring the Delta’s ecosystem, including populations of threatened Chinook salmon and Delta smelt. But as more details of the plan emerge, meeting both of those goals looks increasingly challenging. The proposed tunnels are designed to address a chronic trouble spot in the Delta: the pumping facilities at the southern edge, which funnel water to Silicon Valley, Central Valley farms and Southern California cities. Biologists say the powerful pumps alter the natural water flows, harming juvenile salmon and Delta smelt. To protect fish, federal wildlife agencies put rules in place that slow the pumps during sensitive times of year. 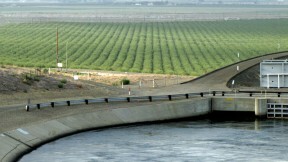 Those restrictions, as well as occasional droughts, have cut water deliveries to districts south of the Delta. The proposed tunnels would use state-of-the-art fish screens, though the south Delta pumps would still be in use about half the time. While several environmental groups say that would be an improvement for endangered fish, the unresolved question is one that’s dogged the state for years: how much freshwater should be pumped out of the Delta and how much should be left in the ecosystem? Federal wildlife agencies stress that species like Delta smelt and longfin smelt rely on freshwater flowing out of the Delta and into San Francisco Bay, especially in the spring and fall. In some years, as much as half of that water is diverted by pumping operations. Environmental groups say the tunnels may not leave enough freshwater in the ecosystem, something they say is crucial for Delta smelt and longfin smelt. Over the last 20 years, an average of 5.2 million acre-feet of water have been pumped out of the Delta each year (one acre-foot is about enough water for an average family for a year). Under the new plan, one scenario would allow 4.7 million acre-feet to be exported each year, leaving more water in the ecosystem. The other would allow 5.6 million acre-feet a year in exports. The difference is likely to be crucial for state and federal wildlife agencies, which must evaluate the impact of the plan on endangered fish. Tunnel construction can’t move forward without permits from those agencies. Leaving more water in the ecosystem is a major sticking point for water districts that would be paying the tunnel construction costs, around $17 billion. Many say it will be challenging to get people to pay for a project that doesn’t guarantee their water supply. “If we don’t come out of this planning process with a preferred alternative that provides more water than we’re getting today, I can’t imagine people making decisions to invest,” says Jason Peltier of the Fresno-based Westlands Water District, which relies on Delta water. “When you see scenarios that reduce the yield of the project, that means the cost per unit goes up and that may push the project toward the range of being unaffordable from a business perspective," he says. “It’s a hard sell for those that would pay for the project,” acknowledges Mark Cowin of the Department of Water Resources. “The case to be made is that if they don’t make this investment, they will see their water supply reliability plummet to drastic lower levels," he says. The state estimates that without the plan, water exports would drop to 3.4 to 3.9 million acre-feet a year. To help bring back endangered fish and offset the impact of the tunnels themselves, the state is proposing to restore more than 100,000 acres of habitat restoration, including 30,000 acres of aquatic habitat in the next 15 years as tunnel construction is underway. The Delta was once a rich web of wetlands and tidal channels, but as California grew, land was converted into farms. About 97 percent of the Delta’s historic habitat is gone. If fish show a strong recovery, the plan allows more water to be diverted from the Delta. But according to biologists, the benefits of habitat restoration are highly uncertain. The plan also faces opposition from Delta residents concerned about the impact of construction. After reviewing public feedback, state officials hope to have a final draft of the plan by the end of 2014.